Show Week! 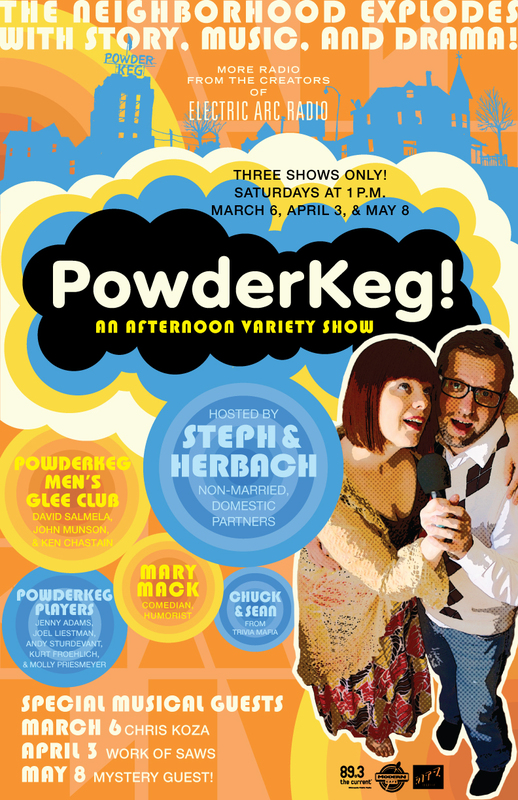 | PowderKeg Live! 1pm on this coming Saturday (MARCH 6)! At The Ritz Theater! 345 13th Ave. NE Minneapolis! We’re finally here and we’re very, very, very excited. Chris Koza singing songs? David Salmela, John Munson (both of The Twilight Hours, etc.) and Ken Chastain (literally the world’s greatest tambourine player) glee clubbing it? A mini-game show hosted by Sean and Chuck? A Mary Mack story? Andy Sturdevant as himself (almost!)? Molly Priesmeyer making noise? And, of course, Steph and Herbach telling tales with the help of great voice actors Joel Liestman and Jenny Adams? It is going to be good, oh yes. Don’t forget, free childcare for 4-10s in the lobby (showing films from the Childish Film Series)! Mike Romens at the bar! 89.3 The Current handing out goodies! The Modern Cafe right next door and ready for us after! Get your tickets now! 12$ in advance. 14$ day of show (a bargain either way, given the line-up!). Missed that? Get your tickets HERE! Have we told you lately that we love you? That is our intention.